MISSION — It was a historic and emotional moment when Armando O’Caña was sworn in as the new mayor for the city of Mission, the first new mayor in 20 years. O’Caña, who beat long-term Mayor Norberto “Beto” Salinas, was surrounded by his family as he took the oath of office. “All of you that are here at one point or another, those who have been here since I was a little baby, a little baby from south Mission all the way to the mayorship, I want personally thank you,” O’Caña said. 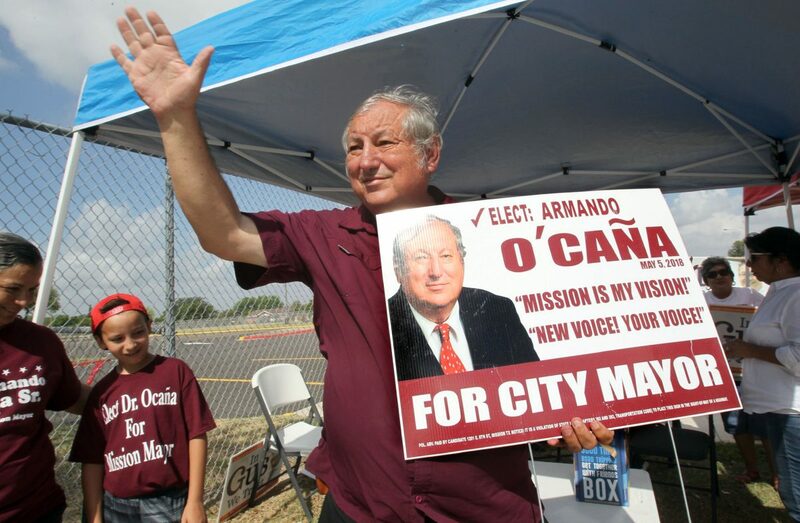 Prior to his election June 9, O’Caña served on the city council for Place 4. Replacing him on the council is Gustavo “Gus” Martinez, who was elected in the special election held con-current with the city elections. Both were sworn in Monday by O’Caña’s niece, Patricia O’Caña-Olivarez. O’Caña-Olivarez, who unsuccessfully ran for 275th district court in March, currently serves on the Mission school board and is an alternate municipal court judge for the city of Alton. Before the two were sworn in, the city canvassed the votes of the June 9 runoff elections. The official results had O’Caña with 3,475 votes and Salinas with 3,318 votes. In the Place 4 race, official results had Martinez with 3,448 votes and his opponent, Julian Gonzalez, with 3,131 votes.